PCL Construction, one of the largest contracting organizations in North America has, in joint venture with BEUMER Group, a global leader in baggage-handling systems, signed a master agreement with the Greater Toronto Airports Authority (GTAA) for Toronto Pearson International Airport’s​ Baggage 2025 initiative. 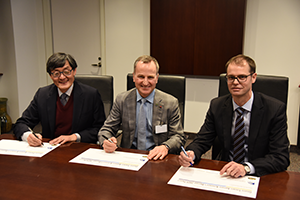 “BEUMER Group values long-term partnerships, and with this contract we are set for a journey that will last for many years with a clear aim to transform Toronto Airport’s baggage handling into a leading airport hub operation,” said Dr. Christoph Beumer, chairman and CEO, BEUMER Group. “We have listened to the GTAA’s plans and applied our open mind and creativity to lay out the best solution for developing the airport’s baggage-handling process for the benefit of their passengers and their staff"
The Greater Toronto Airports Authority (GTAA) is the operator of Toronto Pearson International Airport. The GTAA’s vision is to make Toronto Pearson the best airport in the world. Towards this objective, the GTAA focuses on ensuring the safety and security of passengers and airport employees, enhancing the passenger experience and supporting the success of its airline partners. Toronto Pearson is Canada’s largest airport and the second-busiest North American international airport.